You've invested significant time and resources in establishing and maintaining your ESOP, so it makes sense to ensure that you are getting the most out of it from a cultural perspective as well. 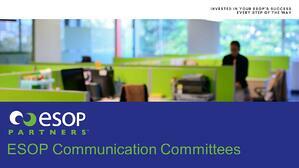 Do you have an ESOP Communication Committee designed to build and sustain an ownership culture? Our eBook, "ESOP Communication Committees," outlines tips and ideas for building a committee that focuses on providing proactive and educational materials for ESOP participants to ensure all participants become advocates for this unique, nontraditional benefit. To request your free copy of this eBook, simply complete the form!